Summary: How do you cope in a world without your mother? 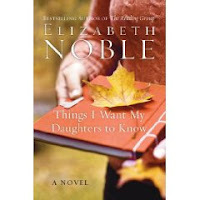 THINGS I WANT MY DAUGHTERS TO KNOW by Elizabeth Noble has been on my radar for quite awhile. I first heard about the book on Book Club Girl's website; and I thought it looked like "my kind of book" (although I have to admit that I was a little concerned that the book might be a bit of downer since it is about a dying mother's last letters to her four daughters.) While I'm usually not on the lookout for books that make me think about leaving my children motherless, I just had a feeling that this was one of those "sad" books that makes you feel better about life. After finishing THINGS I WANT MY DAUGHTERS TO KNOW, I can definitely say that I am glad that I read it. That's not to say that I didn't find myself tearing up multiple times during this story because it was very tragic to see such a vibrant and alive person die so young; however, my overall feelings after reading this novel were very upbeat and hopeful. By the end of the novel, each of the characters had come to terms with Barbara's death and found some sort of peace and happiness. Of course, the four daughters in this novel all were grieving their mother, but I found it interesting to see how each one of them dealt with their grief. Each woman (and even their father) handled their feelings very differently. Not only were the women coming to terms with the loss of their mother, but they were also each battling their own personal issues. Even though at times I felt like shaking them, I did like all of the characters and could appreciate their inadequacies. I liked how Ms. Noble chose to portray the mother. While I am pretty sure that I would have liked her had I ever met her, she was human and had weaknesses, insecurities and secrets like everyone else. I appreciated how the daughters learned many new things about their mother after her passing, including that she was not perfect. I liked how the girls learned to love and accept their mother, both the good parts and the not-so-good parts of her through these beautiful letters. I loved the sections of the book that contained the mother's letters. I found that the wisdom and advice in her letters to be wonderful. What I even enjoyed more was how well she knew her daughters and was able to target her advice specifically to a particular girl. I am pretty sure that this is my first Elizabeth Noble book, but it definitely won't be my last. I thoroughly enjoyed the story, both the happy and sad parts; and I appreciated how well she developed the characters. I am looking forward to reading THE READING GROUP which is on one of my bookshelves. I think THINGS I WANT MY DAUGHTERS TO KNOW would be a wonderful book club selection, especially if your members are moms. This novel covers a lot of topics and feelings that I believe all mothers will relate to. There are a lot of issues to discuss including: mother-daughter relationships (of course), sister relationships, family dynamics, infidelity, marriage, infertility, grief, etc. There is a reading guide available with many terrific discussion questions. If you think you might be interested in this novel, you can read 20% of the book's contents online for free here. On February 17th, Book Club Girl will be hosting a BlogTalk Radio show with Elizabeth Noble. You can listen to the show live and even call in and ask the author your own questions. If you can't make it to the live on-line show, you will still be able to hear the show here. I'm planning on being there, so I hope a lot of you can make it! A big thanks goes out to Nicole from Harper Collins for sending me a review copy of this book. This book looks good to me. The fact that it made you tear up means it's so well written you were emotionally connected to the characters. I love books that make me laugh, cry or feel other emotions. I've got the book and plan to start it tonight. I'm glad you enjoyed it. Great review. Looks like one my book club would enjoy discussing. What a great review! I read The Reading Group by Elizabeth Noble and definitely want to read this one. Thanks for the review! This does sound like it would be a great book to read for a book club selection. This one sounds good, but I don't think I could read it. Stories centered on death are hard for me. Glad you liked it, though. This was a good one Julie. I would love to have met the Mom in it - she was such an interesting charecter!